I've attached screenshot of my Facebook app configuration. I tried to change Site URLs and domains - result remains the same: Facebook integration error 'Given URL is not allowed by the Application configuration.' once I try it out to log into Facebook from my form on live website. Please note, I have removed Facebook integration for now as my website is live, so you won't see the actual error. Kindly use this guide of facebook intergration and try to see if it assists. 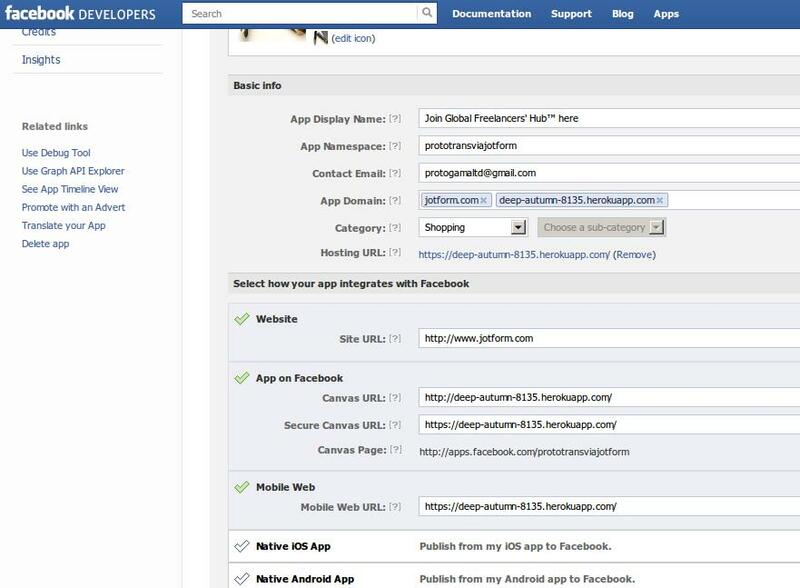 Facebook Integration is used only to collect data from the form user's facebook page. Example, instead of creating a name, email, and address fields in your form, you can have the form user login to his facebook account instead and then as soon as the form gets submitted, the name and address details from the user's Facebook account will be included in the form submission. You will also have options on what data to collect from the user's Facebook account when you integrate your form.